Bombing from the air re-wrote the geography of war, blurring and blasting the boundaries between ‘civilian’ and ‘military’ spaces. But it also required a knowledge of geography. 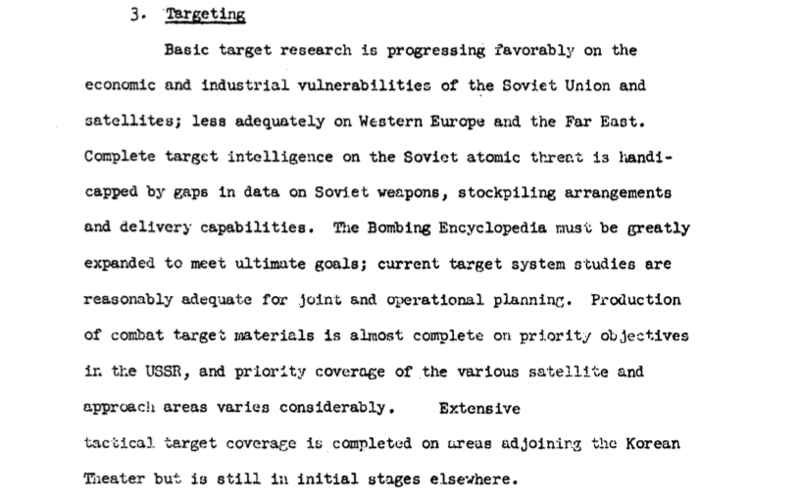 In the Second World War the targeting cycle could extend over several weeks or even months as target folders were compiled, complete with aerial photographs, target maps and intelligence reports, but after the war the United States was determined to accelerate the process. When the US Air Force was separated from the US Army it quickly established its own Directorate of Targets, which was made responsible for the compilation of what was eventually called the ‘Bombing Encyclopedia of the World’. I. Codes for machine processing and hand processing. II. Information identifying and locating the target. III. Information on the category of the target and its individual characteristics within the category. IV. 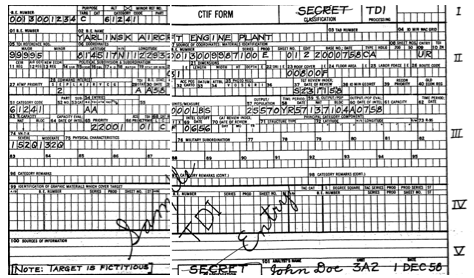 References to graphic coverage on the target. 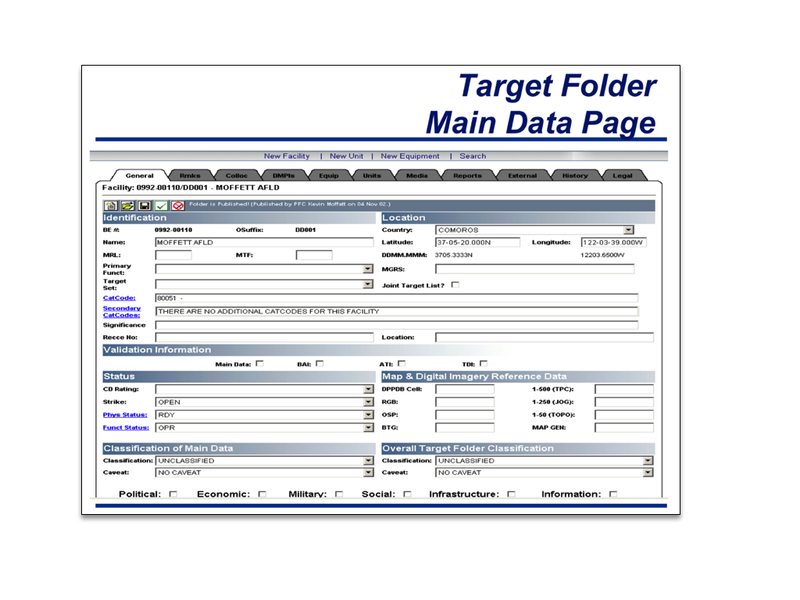 Much of the information is entered on the form uncoded and may be read directly, for example the target’s name (02), location (06), elevation in tens of feet (20), roof cover in thousands of square feet (23), and output in thousands of pounds (57). Some of it is entered in a simple code for which the IBM 705 is keyed. On the form shown, in the country block (08) “UR” represents the USSR; under command interest (28) the figure 2 in the E block indicates that the target has been nominated by the U.S. European Command; and under category requirements (68) the letters C and F indicate that additional information is needed on capacity/output and labor force, respectively. Yet there are significant changes. The BE number refers to an ‘object target’ and its fixed, physical location, and this remains important for active (and fortunately non-nuclear) bombing missions against conventional targets. But in the counterinsurgency and counterterrorism wars conducted by the US in Iraq, Afghanistan, Pakistan and elsewhere the target is often an individual – sometimes identified, if the person appears on a list of ‘High Value Targets’, but sometimes unknown and un-named – and almost always mobile. And for named targets, even the CIA requires more than fifty words for inclusion on its hit list (though the dossiers submitted to its lawyers for approval are reportedly only 2-5 pages). But the irony doesn’t end there. For it turns out that slavick’s project was, until recently, no less difficult for the US Air Force: if not exactly mission impossible then at least mission improbable. When – date, time over target, flying hours, etc. UPDATE: I returned to the Bombing Encyclopedia here. This entry was posted in air wars, bombing and tagged Cold War, targeting by Derek Gregory. Bookmark the permalink.